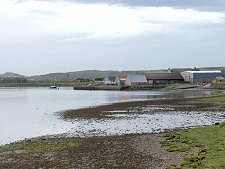 Newburgh is a large stone-built village on the wide sandy estuary of the River Ythan, close to the point at which it is bridged by the A975. 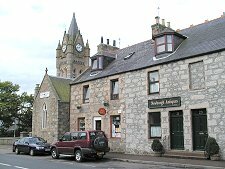 The origins of the village date back to 1261 when a charter was drawn up by Lord Sinclair establishing a settlement here. A little later it acquired the Chapel of the Holy Rood and St Thomas the Martyr in Inch Road. The Chapel is long gone, but the Udny Family Mausoleum which formed part of it can still be seen in the Holyrood Cemetery. 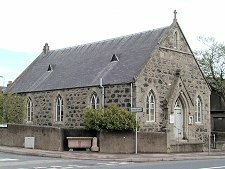 Part of the name of the original chapel also survives, in the imposing Holyrood Chapel on Main Street. This was originally built as a school in 1838, and the clock tower was added in 1892. The village itself developed as a centre for salmon fishing, and later as a small port. By the 1850s there was a steady traffic of boats and barges calling at the newly built quays on the River Ythan. And by the 1880s there was a small fleet of sailing vessels based here, alongside a dozen resident fishing boats. A little earlier, in 1828, Newburgh became the first port in Scotland to have a Lifeboat Station, then called the Shipwreck Institution. The RNLI, as the Institution became, based a lifeboat in Newburgh until 1961, when it moved to Peterhead. In the 1950s Newburgh remained an active port with quays and a mill. Much of its economic base had declined by 1970, but the corner was turned - as with so many settlements in north east Scotland - with the discovery of oil under the North Sea. 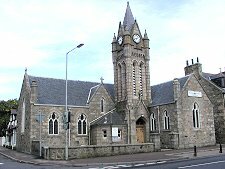 Newburgh, with its attractive setting and within commuting range of both Aberdeen and Peterhead rapidly became a desirable place to live. Today's Newburgh is an active and thriving settlement. 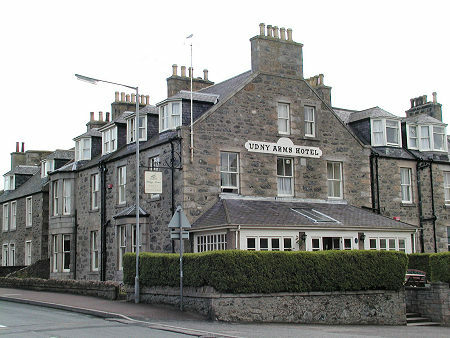 At its centre is the Udny Arms Hotel providing accommodation, great views over the River Ythan, and an excellent restaurant. Beyond the River Ythan lies one of the oddest landscapes in Britain. Forvie Sands comprises an area of dunes some three miles long and a mile wide. At its heart are the remains of Forvie Kirk, built in the 1100s. This is all that can now be seen of the village of Forvie, once a thriving community but buried by shifting dunes during a storm in 1413.